Left: Leslie with Ramsey; Right: Scott and Ramsey talk to Leslie during Team Training. Sorry it has been over a month since I have written an update on Ramsey. Things have been hectic with the move. Things are finally calming down as I only have 7 more boxes to unpack. Ramsey loves his new home. He is two blocks from a dog park but is very content to take walks in the surrounding areas also. He particularly likes to walk in the neighborhoods near our place. Ramsey is quite a character. He has decided to bump the kids while they are eating to see if they will drop some food so he can grab it. No matter how we try to keep people food away from him, he always tries new strategies to get the forbidden food. At least he leaves other people’s food alone now. I’ve taken Ramsey to a doggy wash and have discover that while he loves water, he hates to be groomed. I can hold a brush over him and he’ll start whining. When I tell him to quit whining, he starts growling. He quits growling when he gets a peanut butter snack. Needless to say, it takes quite a while to get him fully groomed. I found a spray that helps keep mats out of his fur and makes grooming a little easier. Ramsey is also a music critic. If he hears a rap song or heavy metal, he starts howling until it is turned off. He likes country and light pop. I always knew he had taste but I didn’t realize that it included music. Ramsey and Scott continue to make outings to the VA where Ramsey performs flawlessly. Most of the people know him and always give him a pet. He enjoys people as does Scott. I let Scott and Ramsey take a shuttle bus from the VA in Vancouver to The VA Medical Center in Portland last week and they did fine. Scott had an appointment at the eye clinic and I had an appointment elsewhere. I think Scott and Ramsey are ready to start taking more solo trips. Ramsey is now watching people and steering Scott away from people and situations that he doesn’t like. Scott doesn’t seem to know when he gets himself in a bad situation and I wanted to make sure Ramsey would get him away from people who could harm him or take advantage of him. Scott and the kids are doing well and things are calming down a bit. Hopefully, next months update will be on time. We really feel blessed to have Ramsey in our family. He is the perfect fit for our family. Although he will never replace Lion and is not meant to be Lion, He is the perfect successor. I’m sure Lion is looking down and smiling at Ramsey. Time flies so fast. Christmas has come and is almost gone. Hopefully, now things will slow down. Ramsey is doing fine and learning new things every day. He spent more time working this month he likes shopping. Ramsey is like Scott, he loves people and especially likes children. 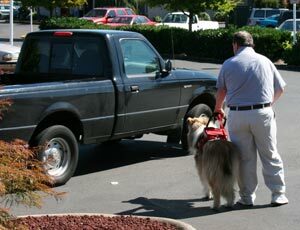 Scott and Ramsey are always stopping and talking to people and sometimes it’s difficult to get errands done. Ramsey and Scott are very close. Ramsey is beginning to sense Scott’s needs and respond to them. He watches Scott every time when he gets up since Scott’s balance is still off. Ramsey makes sure he gets to where he’s going safely. If Scott falls he goes for help. Yes, he still gets the phone. My last day of work was December 23, now I’m more available to help get Scott out more. I still don’t feel right about letting them go on the bus, so I’ve been transporting them. I plan on having Scott resume more of his old routine next month. Ramsey learned how to open Christmas present much to the kids delight. They thought that they would get a preview of their presents. Unfortunately, I caught him and stopped the fun. He also learned to work with the cats and on snatching ornaments from the tree and batting them across the room. Ramsey also has become a pro at stealing stuffed animals. he was stealing the pound puppies out of the kids stockings. We brought Ramsey to Christmas Eve services, He was very good during the singing but when the sermon started, he started moaning much to the delight of the congregation. I ended up taking him out because he was distracting. After a talking to, we went back in and he behaved. Ramsey is doing well when we go out to dinner. He no longer tries to grab other peoples food. At home, he constantly is looking for leftover crumbs from the kids. When he finds something, he runs and hides so I can’t take it away from him. Scott is finally better and has had his teeth repaired. All the kids have had colds and are recovering. I had an angiogram and found that I need a medication change to reduce pressure in my heart. Our family is finally on the mend. I first met Ramsey in September 2004, when he and Scott were paired up as a team. He was standing in a fenced area near the kennel with his fur blowing in the wind. 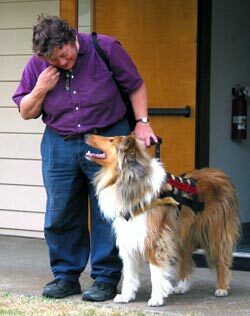 I remember thinking how beautiful he was and wondering if he were up to the honor of replacing Lion as Scott’s service dog. Upon observing their first meeting all doubts were erased. It was love at first sight for both of them. We visited Ramsey during his training and got further acquainted with him. Team training took place and the pair worked together as if they had been working as a team for years. 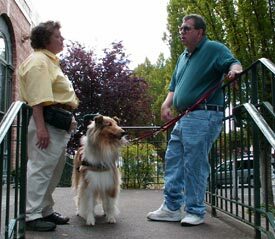 Ramsey was helping Scott walk safely, manage stairs and terrain changes; helping him get where he wanted to go. Even transitioning to helping him when he began using his wheelchair. He was always finding new ways to help Scott. One day when I was out of town, Ramsey proved his ability. Scott fell when he was alone. Ramsey handed Scott a phone to call for help. Ramsey learned what each member of the family needed. He realized that our son Josh needed a friend, Our daughter Alex needed a confidant, and I needed someone to look after me. Ramsey was very loyal and protective of his family. Nobody or nothing dangerous could approach. In July 2009, we decided to take the kids on a trip to Disney World in Orlando, Florida. Ramsey of course went along. Upon reaching Orlando, we discovered that our room reservations had not been passed on by the travel agent. We found a motel and checked in. In the morning, I took Ramsey out for his walk. He seemed nervous and did not want to go into the courtyard for his walk. I stopped to talk to some people , he kept whining trying to get me to leave. Unfortunately, I ignored him. He suddenly jumped in front of me. As we walked back to our room, Ramsey started trembling and looking at me asking for help. By the time we got back to the room he was in seizures. Within the hour he was dead. He had been bitten by a coral snake. What can you say about a dog who saved my life, but lost his own in the process? Ramsey was more than a hero. I am alive today because of Ramsey. He gave his life out of love and loyalty. Even 9 months after his death, there isn’t a day that I am not grateful to Ramsey for his ultimate sacrifice.